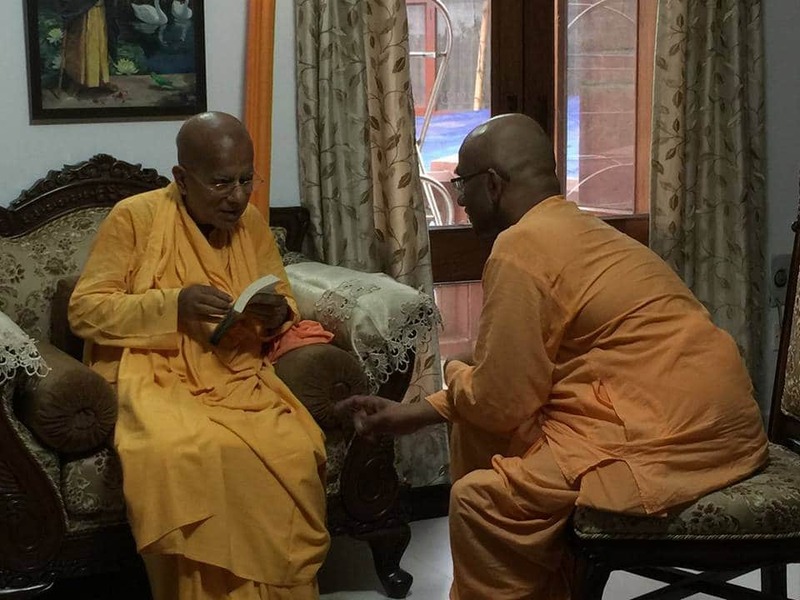 While I was in Delhi, I had the fortune of meeting HH Gopal Krishna Maharaj. Though he had returned from a tour of the West just the previous day and was exhausted, he kindly agreed to meet me at his quarters at the Radha Partha Sarthi temple. I gave him a copy of my latest book Demystifying Reincarnation. After glancing through it and appreciating its detailed table of contents, Maharaj mentioned an earlier book of mine:10 Leadership Sutras from Bhagavad-gita. About a year ago, he had called me, saying that he was scheduled to give a talk in China on spiritual principles for corporate leaders. He had got my Leadership Sutras book and wanted to know whether I had any additional teaching aids with it. Honored and humbled by his request, I had sent him my Powerpoint presentations on the book. During our meeting, Maharaj told me that he had gone through my book and had found it good. He added that it was a bit too analytical – for a busy businessman, it didn’t give any immediate carry-home points. I admitted that limitation, adding that it was not easy to convey the Bhagavad-gita’s philosophy in bullet points that would be intelligible and appealing to new people. 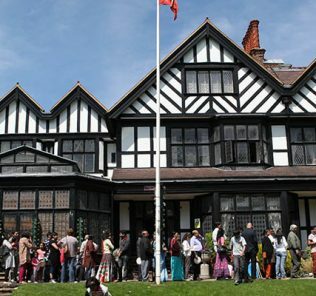 Accepting the point, Maharaj suggested that we needed a book explaining how the Gita can help people deal with practical problems such as stress, depression, addiction, job loss and relationship breakup. He said that such a book, which could be titled something like “The Bhagavad-gita applied for daily living” would become a hit. I found Maharaj’s suggestion so superb that I started wondering why till now no one in our movement, and why I myself, hadn’t thought of a book like this. I have often found inspiring Maharaj’s keen awareness of the contemporary pulse and the opportunities it presents for spiritual outreach. About a decade ago, when the recession had bedeviled the global economy, Maharaj had suggested that I write a book about how the economic meltdown was ultimately caused by greed. Accordingly, I had written the pocket book “Recession – Adversity or Opportunity?” delineating a three-point solution: Simplify, Clarify and Purify. Maharaj had liked that book, written the foreword for it and had even gifted it to the Prime Minister and the President of India. He had also gifted it to the President of Mauritius, who too had appreciated it and had even written a review for it. That book had become by far my best-selling book till date, and I felt that the book on Gita applied, again suggested by Maharaj, would do equally well. I thanked him for the brilliant idea and promised to work on it as soon as possible. 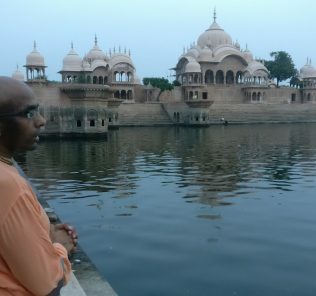 When I mentioned to Maharaj that I had been writing about the practical application of the Gita at gitadaily.com daily for nearly six years now, he was intrigued. 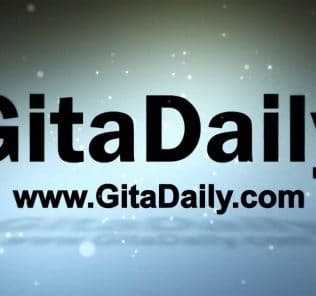 He glanced through the Gita-daily app on my phone, appreciated the articles, especially their titles, and asked me to subscribe him by email. As we discussed about online outreach, I asked Maharaj about how he dealt with criticism, especially misleading misrepresentations on the net, which inevitably befall anyone who becomes well-known. 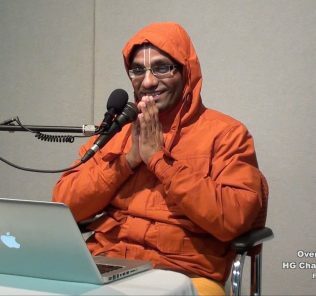 The clarity and conviction of Maharaj’s answer stunned me – he said, “If someone wants to go to the Internet to learn, why do they need to come to me?” While we may occasionally counter negative material, ultimately, we can’t stop it. People have their free will and those who wants reasons to stay away from Krishna will find reasons, with the Internet serving them as an aide. However, the Internet doesn’t control our preaching – Krishna does. If we try to serve him sincerely, he will guide us how best to serve him, and how best to respond to criticism. 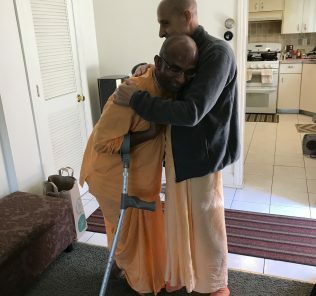 When I sought Maharaj’s blessing for my tour of US from August end, he enquired about my programs and offered his blessings, stressing that a lot of work needs to be done in the country where ISKCON was founded. When we were discussing the comparative preaching scenarios in the West and India, I appreciated the phenomenal preaching in Delhi – with over a dozen temples either opened or soon to be opened, with hundred or more brahmacharis in the two leading temples, with hundreds of devotees coming to each temple, with thousands coming to the bigger temples, including, of course, the marquee Radha Partha Sarthi temple. 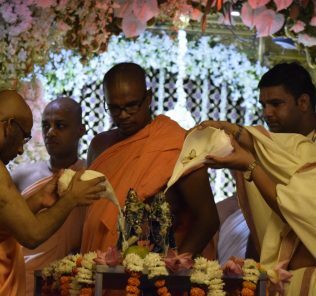 I said that, under Maharaj’s expert stewardship, the capital of India was fast becoming the capital of ISKCON’s preaching in India. At the end of our eighty-minute meeting, I felt enormously encouraged and enlivened by the association of one of the foremost commanders of Srila Prabhupada’s army. That is so inspirational . HH Gopal krishna Maharaj is visionary person . Thank you prahu for sharing. You are amazing and the service you are rendering is unimaginable and is so very inspiring. Please continue on your mission! Western people attracted to Krishna consciousness like myself require material like this to keep our faith strong in a very material world. Both you and HH Gopal Krishna Maharaj are shining lights of bhakti in this world and your power is felt very directly, even if it’s only via the medium of books and the internet.